Monday mornings roll around rather quickly. I have fresh inspiration to start the week anew, eating healthy and convenient. Fresh and clean eating starts with being prepared. For us to enjoy nourishing meals throughout the week, it starts on Sunday. Well, back up a minute…on Saturday, with vegetable shopping. For convenience sake, I do a lot of prep on the weekend. I buy what fresh produce I know I’ll be using for the following week. It usually includes a mix of leafy greens (kale, dandelion greens, collards, chard, watercress and lettuces) for smoothies, sides and salads, along with an assortment of roots and tubers. Arriving home with grocery bundles, I unwrap the leafy’s, freeing them from their wire twists. I then proceed to soak individual bunches, one at a time, in the salad spinner and rinse, repeating the process a few times. They end up cleaned and spun dry, stored securely in their cloth produce bags, covered with a plastic produce bag. Getting one batch soaking before I even unpack groceries proves to be a great time saver. This task ensures we will be enjoying greens throughout the week 2 – 3 times a day. What a great boost to my spirit knowing this has been accomplished! It won’t be long when our garden will be in full swing and our own crisp produce will be gracing our table. Can’t wait! Having said all of that, are you still with me? 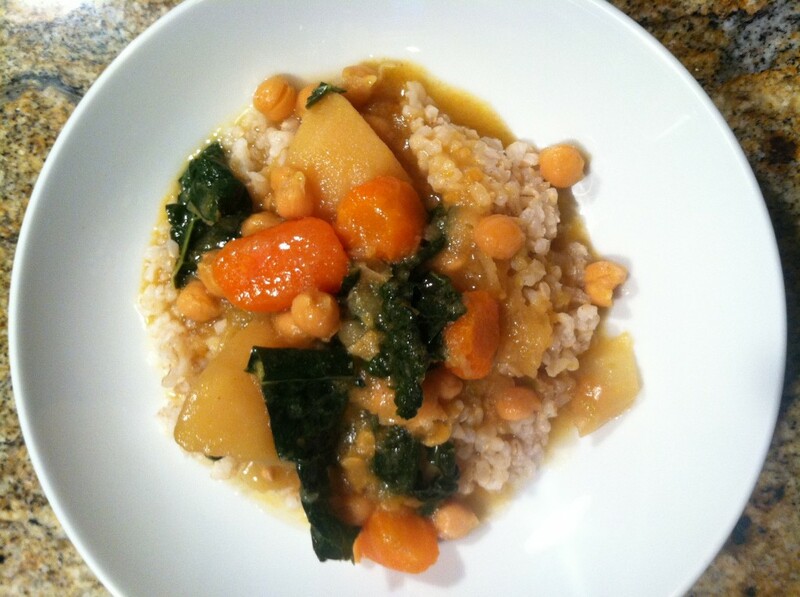 I created this crock pot meal with the same mind-set of wanting to be prepared to eat healthy. It is a vegan dish, but feel free to experiment by adding chicken. I have not done this, but I think it would be a welcome addition. Garbanzos, also known as chick peas, are a part of the legume family, and have a delicious nut-like taste and buttery texture. A very versatile legume, they are a main stay in many Middle Eastern and Indian dishes such as hummus, falafels and curries. 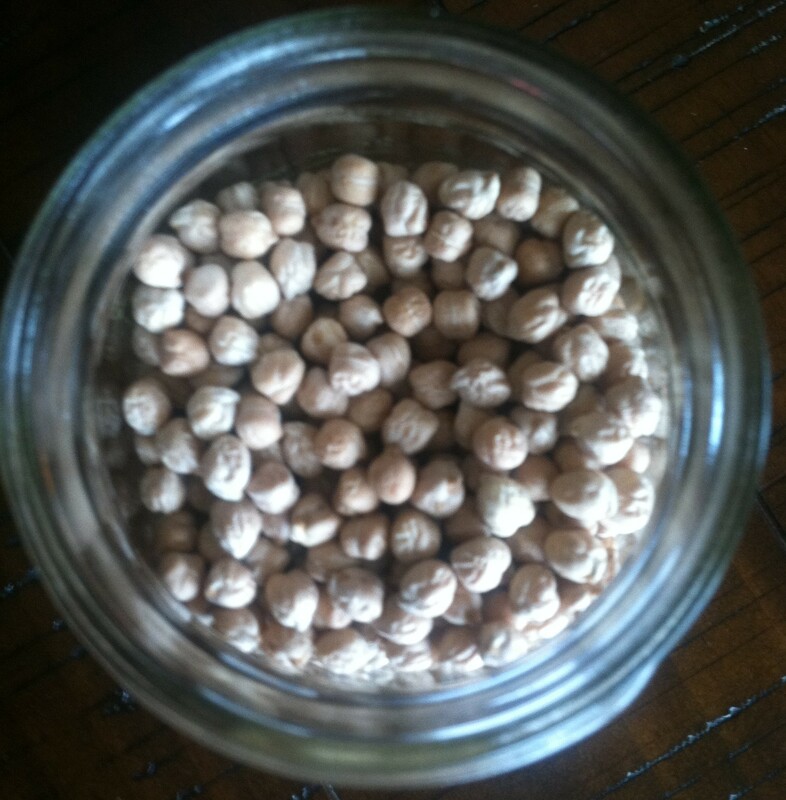 The garbanzo bean is high in fiber, potassium and folate. But its high protein and iron content also make it a suitable substitution for meat. Because of its nutritional profile, the garbanzo bean offers a number of health benefits and makes a good addition to anyone’s diet. They are known to give digestive tract support, decrease cardiovascular risks, and because studies show they give us a feeling of being satisfied and full, they help to decrease caloric intake. For more on their many benefits read about them on the Whole Foods website. You can purchase them in the bulk department at your local natural foods market. They store well in your pantry in a covered and clean glass jar. In the following recipe they are soaked overnight, drained and placed uncooked in the crock pot, along with other ingredients to simmer all day. Please notice I don’t add salt until after the beans have become soft. Dried beans soften successfully without the addition of salt. Not that I’m saying to cook beans totally without salt, just saying to wait until they are soft from cooking to salt them. Experimenting with cooking dried legumes in the crock pot has given way to some new convenient recipes. I hope you like this one. Feedback is always appreciated! Serve this over your favorite cooked whole grain along with a fresh, crisp salad for a complete meal. 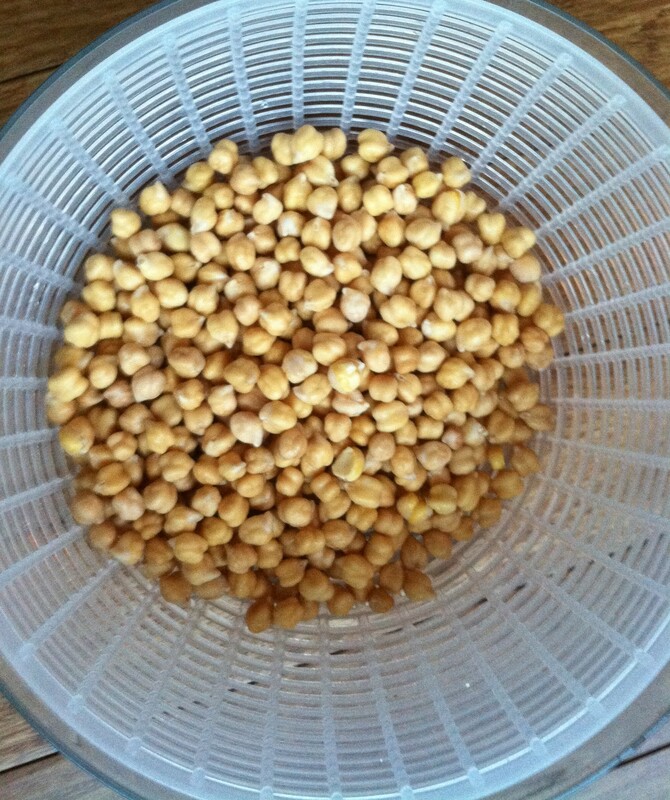 Rinse dried garbanzo beans the night before, place in a medium size mixing bowl and cover with plenty of water. Let soak until morning. Drain. To save time in the morning, I prepped my veggies the night before and stored them in the refrigerator secured in a sealed plastic bag. (Keep the chopped Serrano chili separate from the other vegetables). Or, prep them the morning when you assemble this dish to cook all day. 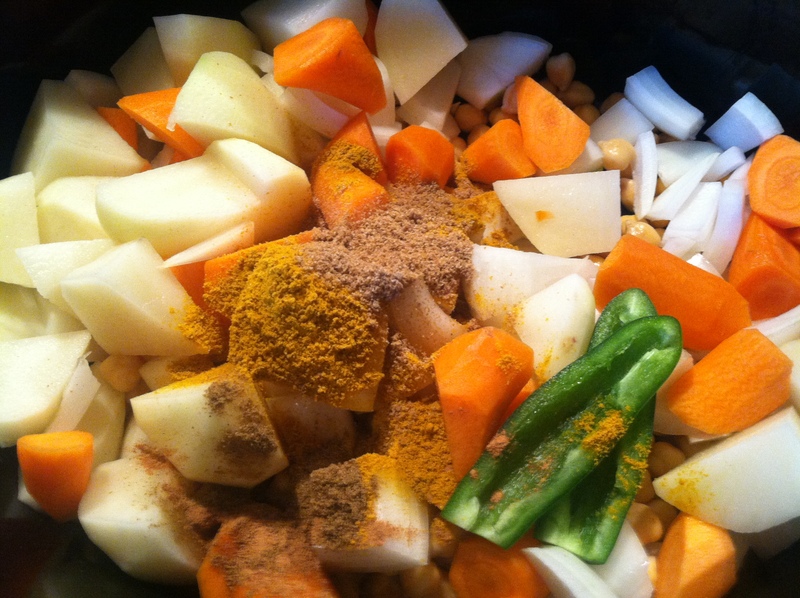 Layer the garbanzo beans, onions, carrots, potatoes and Serrano in the crock pot. Sprinkle in spices. Pour in coconut milk followed by 2 cans of water, adding it to the mix. Give it a quick stir, cover and set on low. Cook for 8 hours. About 15 minutes before serving, add the salt, Rapunzel powder (or bouillon) and chopped kale. Cover, allowing the kale to wilt and lightly steam. Add the juice of 1 lime. Season to taste with salt. Stir and serve over cooked quinoa, or rice. I do love curry! I’ll have to try this recipe since the crockpot way would save lots of time. I’ve not used uncooked garbanzo beans in before in any recipe. The canned garbanzo beans are what I’m more familiar with and I often use. Are there disadvantages to using the ones in the cans? It definitely helps, Amy. Thank you!